Thank you for subscribing to Ryders Alley event updates. The Ryders Alley heated clubhouse features a lounge, couches, movie screen, projector, and table games. Each member has a battery tender and receives their own shelving for tools and related accessories. We offer a communal workspace for members with bike lifts, work benches, tire changers, air compressors, hose and bucket for washes, and optional communal toolbox access. Service for tune-ups, modifications, and repairs is available via authorized, third-party repairs shops. Trailered bike transport can be arranged with advanced notice. A one-month security deposit will be charged along with first month’s dues. Upon email notification of membership cancellation, the security deposit will be credited towards dues for the next calendar month (from the notification date). Payment is by credit card only (Visa, MC, Discover) and on autopay. Members must pass a criminal background check before acceptance. Trailbike: $350/day (NJ), $500 (out West). Dirtbike: email us. Includes bike rental, gear, gas and guidance. KTM 350 EXC is generally available. We don't offer insurance, so you're responsible for any damage while renting. $400/day includes quad, gear & guidance. 2011 Polaris 550 Sportsman is generally available. We don't offer insurance, so you're responsible for any damage while renting. $175/person, includes coffee and donuts with a 10-minute break. Instructor: Armen Amirian has been teaching motorcycle maintenance in NYC for 38 years. The fact that you own a motorcycle in NYC and work on it indoors puts you in the enthusiast category. One of the advantages of Ryders Alley is being able to work on your own bike. Time-permitting, the only problem is knowing where to start. Few were born knowing how to work on machines and that’s where this seminar comes in. The objective is to spend an evening going over the basics of what motorcycle maintenance is all about. We’ll ask for a few volunteer bikes (hint: if you sign up early, we’ll probably use yours). Chain and sprocket inspection, lube, and adjustment. Brake/clutch fluid inspection and bleed. Tire inspection and tire pressure. How to pick up a bike without hurting yourself. No tools or experience are required. All we request is that if your bike is being used, please have a shop manual (electronic or paper) for us to check specs. If we are checking the charging system, the battery must be fully charged. Email us for a quote and visit our drone website for action shots from Ryders Alley, a FAA licensed and insured drone operator providing aerial photos and interactive, 360 degree videos. 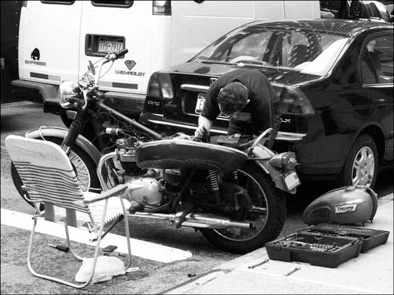 Instructor: Armen Amirian has been teaching motorcycle maintenance in NYC for 39 years. This isn’t a garage, its a community. Ryders Alley is about building a team who share a passion for motorcycles. It's a haven for gear-heads, with indoor access to a safe, clean workspace, lounge with couches; it's a space to get that motor smell and escape the apartment. We screen the distinguished MotoGP series and more. We get city folks out to the track & trails. "Ryders Alley is a dream come true. It's taken a lot of work and is a continual work in progress. I’ve had a lot help from friends." Please complete this form to start the application process for monthly membership. For long term storage, please email us. You will need to provide a copy of your bike registration (for street bikes) or original title (for track/dirt bikes) for inspection only, current Drivers License, and pass a criminal background check. All information will be kept 100% private and not sold or shared in any way. Thank you for your Ryders Alley membership application.